Day 1 - Welcome to Costa Rica! : We were picked up at the airport and taken to a Best Western hotel a short drive away with a pool, health club, shops, restaurant, bar and casino. Breakfast was included in the morning. Day 2 - Central Pacific Coast: We went by shuttle to the port city of Quepos on the Central Pacific Coast. We stayed at Hotel Costa Verde, a hotel popular with fisherman and eco tourists alike that was perched on the lush mountainside above Manuel Antonio overlooking the ocean and the amazing national park. This was a great beach for surfing lessons, snorkeling, shopping or just relaxing on the white sand. Just what we had in mind! Day 3 - White Water Rafting: We loved the full day of white water rafting on the Rio Savegre, a Class III river that runs through beautiful primary rainforest. The river trip took us through tropical jungles not accessible by any other means. We ate breakfast on the way, enjoyed a big lunch along the riverbank and saw tons of amazing wildlife. Day 4 - Sea Kayaking: The next morning after breakfast we hopped in some kayaks and cruised along the coastline admiring the breathtaking scenery, getting a great workout and exploring the mangrove forests filled with an huge variety of birds and wildlife. Day 5 - Day free & Sunset Cruise: It was great having a day with nothing to do but relax on the beach. In the evening we boarded a cruise ship and headed up the Pacific coastline where we eventually anchored. The kids snorkeled while we enjoyed a great dinner and watched the sun sink into the ocean. A picturesque way to end our day! Day 6 - Volcano Adventure: The next morning we were off to La Fortuna and Arenal Volcano Hot Springs area. We stayed at the impressive Los Lagos Lodge and had spacious double rooms with volcano views from the patio. The hot springs were heated by the thermal action of the volcano, and one of the big pools had a big water slide: another a swim-up bar. We were lucky enough to see the volcano erupt and lava flow down from the cone. Day 7 - Canopy Tour: This day was amazing! After a thorough safety lesson and being fitted for our climbing harnesses, we climbed to platforms mounted up to 100 feet above the jungle floor. Our guides connected us to the cables rigged to pulleys and then we jumped, soaring between platforms and through the rainforest canopy. It was unlike anything we'd ever done and a unique way to experience the wildlife and ecosystem. 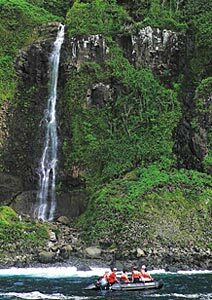 Day 8 - Spectacular Waterfalls: We spent this day visiting the majestic La Fortuna Waterfalls. We rode horseback through pasture and forest with the Volcano looming above us and then hiked down to the base of the waterfalls. Day 9 - Arenal Hanging Bridges: This expansive set-up is located in a rainforest preserve of 250 hectares not far from the hotel. The tour spans 3 kilometers of natural trail with over a dozen bridges elevated in the canopy. This was another good day of exercise and a great way to explore the cloud forest. Day 10 - San Jose Return: We were picked up in the morning after breakfast and taken back to the Best Western in San Jose. That evening we had a nice dinner and did some shopping. Day 11 - Crocodile Safari: We were picked in the morning up by our English-speaking guide for a boat tour up the Tarcoles River. We saw a lot of crocodiles, one of which our guide said was over 17 feet long! We also saw tons of wildlife and more species of bird that we could count including the beautiful and endangered Scarlet Macaw. Day 12 - Departure: In the morning we were picked up and taken back to the airport for our flight back to the States.